Vill01 Deauville plage est, StP. Gruppe Villers sur Mer. We stayed in Trouville (its cheaper than Deauville) which is a lovely town. There is plenty of parking and you can walk the port & sea front. Do this on a lovely sunny day. Then its really worth it. Bauform Vf600v ringstand for5cm KwK gun. Vill01 covers the right hand side of Deauville from the dock area to the beach which is slightly different now as there is a new Yacht Marina and housing complex. 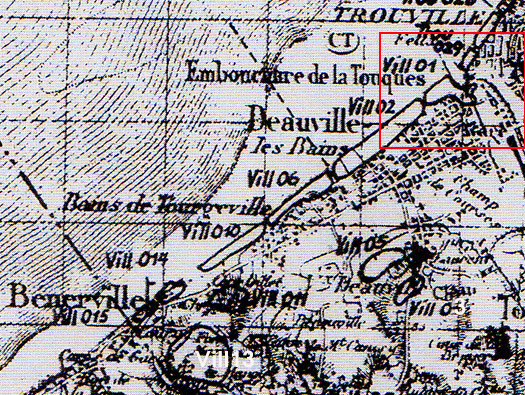 The area I think is covered by Vill01. 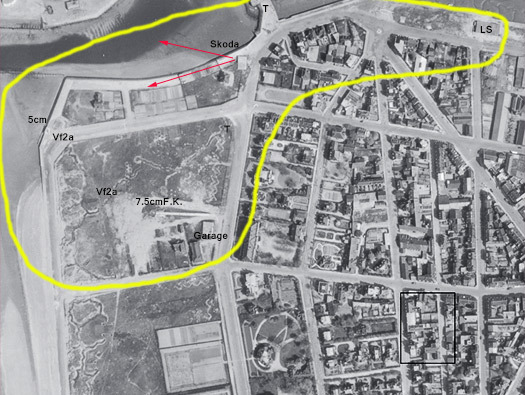 Most of the southern area has either been built on or a large Yacht marina has been dug out. 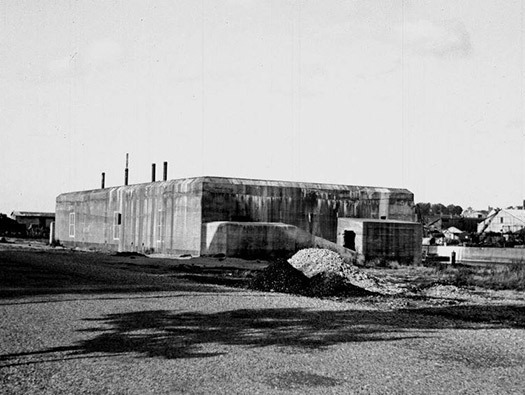 Luftschutz bunker, air-raid shelter, a large bunker with several internal rooms with entrances at both ends. Often a Tobruk each end as well. This looks like a Tobruk. Tobruk as an AA role. Looking from above you can see the entrances and also two Tobruk's covering the entrances. This is the view from the road, and built on the roof is now the Deauville Yacht Club. A door has been cut into the side to allow tractor parking and storage. Air vent with the cover removed. One a little like this may have been used. Tobruk. Now on the edge of the inner docks. Now on the edge of the inner docks. 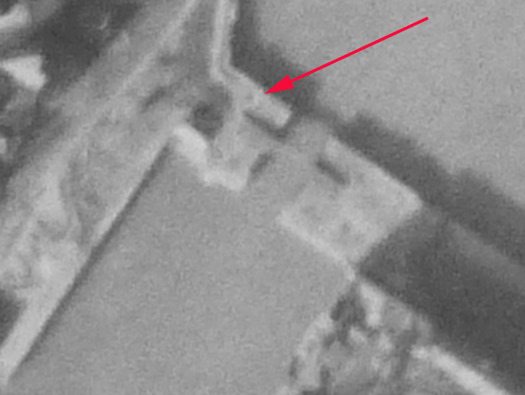 This does look like a Tobruk covering the inner waterway. The docks were blown up as the allies worked their way up the coast. 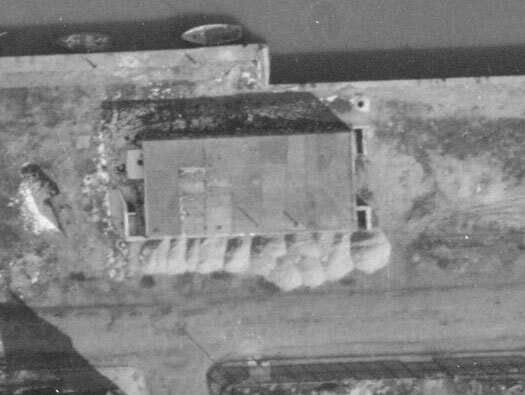 Where I think there was a Tobruk set into the Lock. How it looked before being blown up.. It would have looked very much like this. 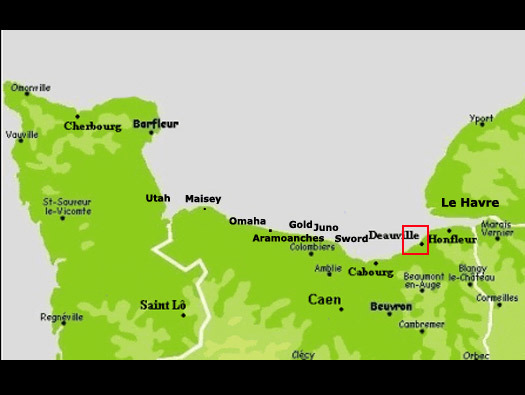 Vill01 Deauville plage est Tobruk. This Tobruk had two rooms, a gun room with the Tobruk ring in the top and a small living/ammunition room down three steps. Also a door out or a manhole in the roof to come and go by. The estuary of the Toques river. The ferry to Trouville. 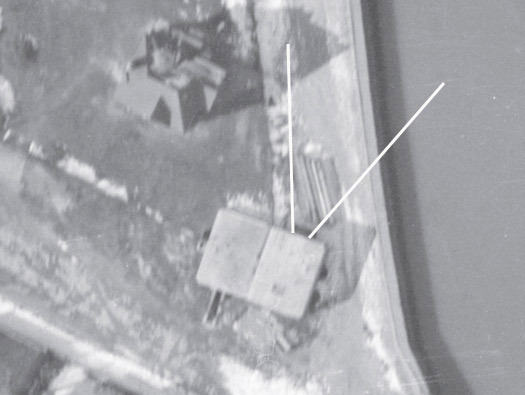 Possibly a 4.7cm Pak K36(t). I think this may be the 4.7cm Pak K36(t) the right hand side as you can see the waste ammunition pit in the front. 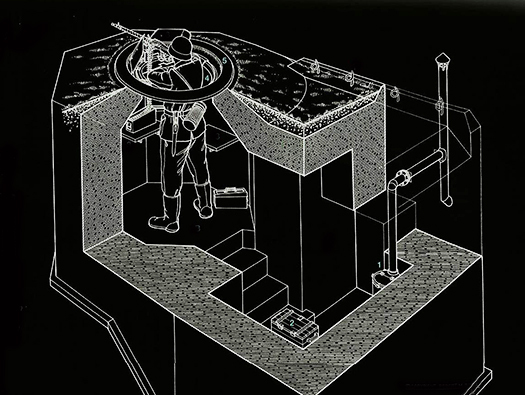 The attached bunker could be a living bunker?? All this has now been removed. Plan of the Skoda bunker. The Bauform Vf600v sitting on the edge of the quay with the Vf2a crew bunker behind. Not the trenches behind. It may have looked like this one. 5cm KwK is a ringstand. Vf2a crew bunker entrance with my wife in deep thought. Vf2a crew bunker emergency escape in the middle. Vill01 Deauville plage est concrete road. A concrete roadway to the river?? 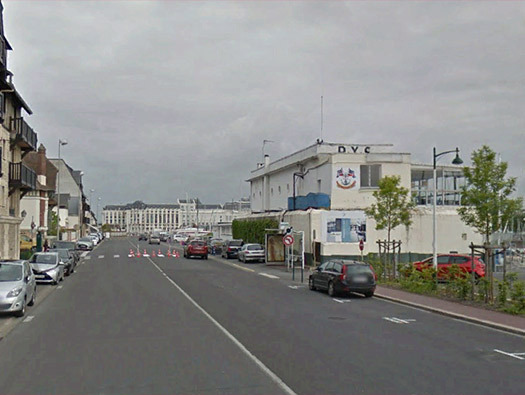 Trouville Casino in the background. Vill01 Deauville plage est concrete roadway. A concrete roadway to the river?? Steel reinforcement. Tobruk Ring??? Well it could have been. This area is now under housing. 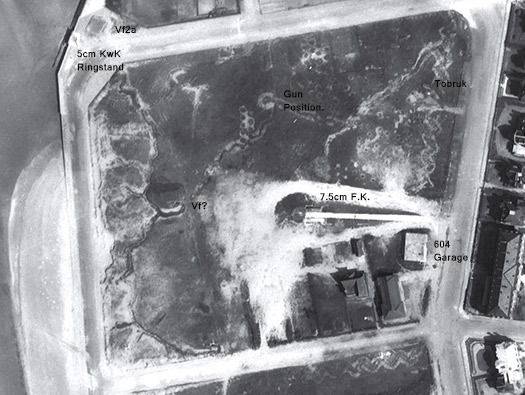 An R604 gun garage, a position for a 7.5cm F.K., a Tobruk and a Vf bunker with trenches. 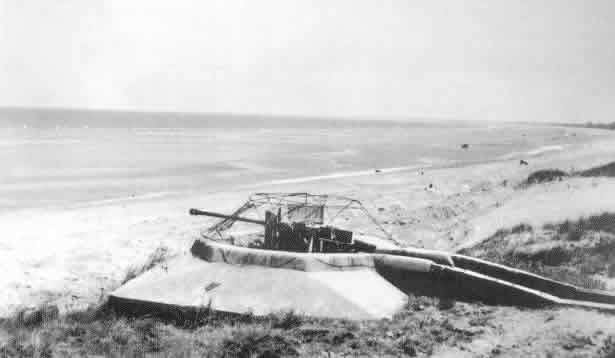 The gun position in the middle may be a 5cm KwK L/60. This is the area today..
R604 gun bunker and Field Kannon turntable. Vill01 Deauville plage est command cable. There must be thousands of miles of these cables all over Europe.